Have a nice landing dear blogger, If you are interested in this topic, then I guess you are a blogger who wants to make the blog post more professional in less time. There are many aspects that makes your blog post a professional article and featured image is one of them. Creating a professional featured image for an article is a bit time-consuming job and it also requires some good skills at image editor tools such as Photoshop or GIMP etc. Well, here is new online tool – SNAPPA which is helpful to create a professional featured image for your blog post in a very less time. Snappa is an online tool for designing the images for digital marketing. You can design social media posts, advertisement banners, images for your articles and header images for social media with Snappa. 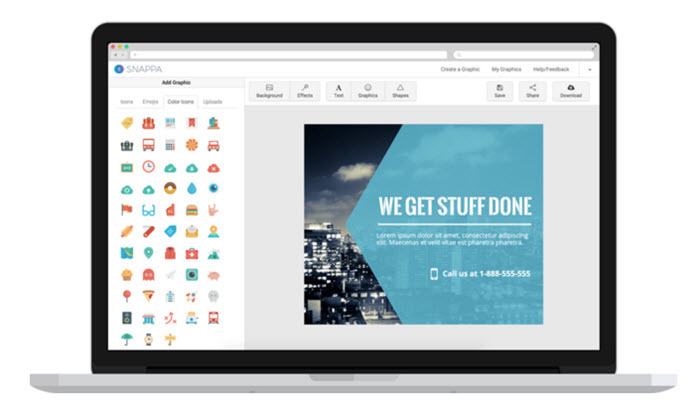 Snappa comes with hundreds of pre-designed templates which makes your designing work easier. Why SNAPPA is Good to Design Images for a Blog? There are many reasons to choose Snappa to create a featured image for your blog post. As mentioned above, it comes with hundreds of creative templates, more than 8000 Photos & Patterns, over 2000 Graphics & Icons and more than 200 fonts. Along with these features, you can also add image effects and save your custom designs in SNAPPA. How to Create a Featured Image for My Article with SNAPPA? Creating a featured image for your blog post with SNAPPA is easy. All you need is to create an account in Snappa. Once registered, login to your Snappa account. Now scroll down to ‘Blog’ and click on ‘Blog Featured Image’. Choose an appropriate template and start designing an awesome featured image for your blog post with SNAPPA. What is the Pricing of SNAPPA? Snappa comes in 3 different plans- Starter, Pro and Business. Starter plan is free which let you design 10 images per month for a single user with minimal templates. Pro plan costs $15 per month that let you design unlimited images with access to all the templates for a single user, Business plan costs $30 that comes with unlimited images and unlimited preset templates for 5 users.